h/t to Scarlet Pumpernickel for keeping watch on volcanic things while I was off playing at the Atlantis launch. small earthquakes in a line across the caldera though. but there is steady activity down to 10-15 km depth, suggesting some magma movement. Police are warning of strong H2S odour on the sands, and possibly lethal concentrations of the gas in low lying areas nearby. The river is rising, not clear when it will peak at this stage, water conductivity is high, indicative of high concentrations of ionic salts, and geothermal origin. I used to take samples of the river water, for the hydrology group, using a boom off one of our trucks, hanging off the bridge across the river. Checking on salts and solutes. Every time I’d swear the damn sulphide smell got stronger, we had instructions to cut the wire and leave fast if the smell spiked and the river started rising. This entry was posted in Earth Sciences and tagged earthquakes, Iceland, volcanoes. Bookmark the permalink. This is all we need! No money! No Oil! No Gas! No Shuttle Follow-On! No NASA (that’s worth a flying fig)! Twenty-Six US/NATO wars around the globe. No Credit! No money of any real value! No Leadership in the WH or any Department! No congress in the Congress! Senile Senators! Currupt Representatives! Government Employee Unions! Corporate Leadership that can’t manage their way out of a soggy wet paper bag. And what starts happening? Cooler weather all over the world! 7+ earthqaukes popping all over the Pacific! NewsCorp being ripped apart by howling wolves and AGW/Anarchist idiots. And MORE Icelandic eruptions!!! I’m telling you, if this doesn’t stop right now, I’m going to tell the whole World to go to hell and take the wife to the Beach. PS: Hope the Launch was AOK! You could do worse, Pascvaks! (Unless the water is cold). The situation does look somewhat gloomy. http://www.dv.is/frettir/2011/7/9/hlaupid-i-mulakvisl/ More photos of Katla flood. Great to be on top of developments. Until now Katla activity is rather small so we’ll have to wait for the bigger fireworks. bedroom – yes, volcano – not so. I noticed the activty at Katla yesterday. Let’s hope it is not the big one. 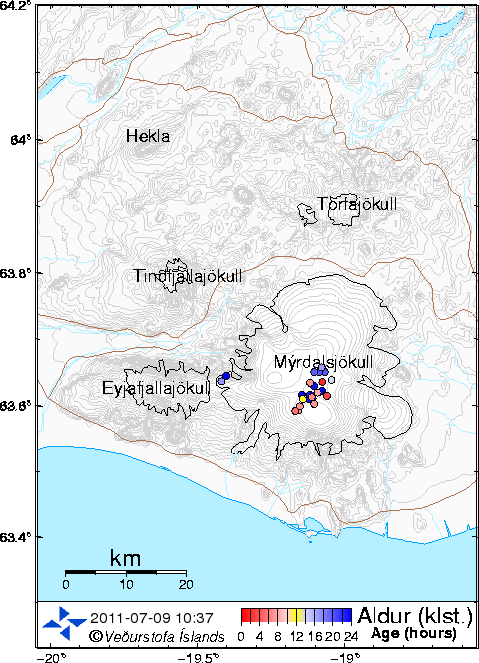 The earthquakes in the region have been gradually focusing down to three regions, one half-way between Katla and Eyjafjallajokull, the grouping that you showed above, and which caused the jokulhlaup, and a third nearer the coast. This focusing started in about April, and has now continued even after the flood today, so I rather doubt that this is over. Great piece. Let’s hope everyone takes the appropriate precautions. I checked and comments are allowed, so I have no clue why they aren’t going up. Sorry!! Sorry, didn’t mention Metheusala’s grandfather made my Ol’ HP?